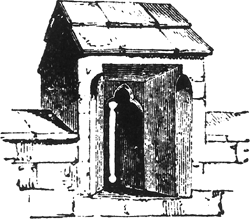 A vertical slit for archers in medieval fortification walls, with jambs deeply splayed toward the interior. The property has undergone and extensive refurbishment yet retains much of its original character features such as arrow slit windows and internal stonework. Our apartment was against the inner wall of the Tower and the walls were eight-feet thick - except for an arrow slit where I used to keep my beer cold. What Dickinson was saying is that the Gold Cup is not so much a window of opportunity as an arrow slit. The exposed stone wall with arrow slit windows is a nice touch, with imported slate floors and zone controlled underfloor heating to the ground floor, beamed ceilings and cosy wood burning fireplace. It is Grade II Listed, retaining many of its original features such as high ceilings, exposed beams and arrow slit windows, and has four bedrooms including an en suite master, three bathrooms, and a 28ft dining kitchen. The BBC has announced that, from June, it will be scrapping its morning bulletins on the station, which gave our sport an arrow slit rather than a window of opportunity on a football-obsessed station. Inside,original arrow slit windows have been retained and reclaimed timber has been used in new construction. At the far end a dramatic bow-ended domed roof and recessed area is lit by elaborate stained glass windows, while the master bedroom includes two unusual arrow slit windows. The walls on the stone stairs are so thick I can sit in the windowsill and there's a stone staircase going to the sleeping quarters with an arrow slit in the wall; it really makes the place unique. There is a stone barn, formerly stables and a picturesque courtyard of two storey and single storey structures, currently used for storage, details including arrow slit openings and lovely old stone work. He was gutted, not in any unsporting way, but because he knew, deep in his water, that the chance would in all probability never present itself again - that arrow slit had opened, momentarily, and then slammed shut. But in many ways the most startling Cheltenham news of the week is that Channel 4 have decided they will cease to broadcast any racing if the BBC exploit a current window - or arrow slit - of opportunity to regain coverage of Cheltenham, which they lost in 1995.